Paving Over Memory Lane; Chico’s Monkey Farm; Nowhere to Go and No Hurry to get There; More Motorcycle Adventures on Back Roads Georgia Highways 17 and 341; Wooden Nickels. I’ve never had a great memory. That’s why I write things down. Old photos of family and friends, and places I’ve been help me somewhat, but actually seeing the old things helps me the most. Highway 17 used to be the main conduit between Florida and Maine and was filled with fascinating, and sometimes troubling, roadside entertainment. When I-95 was completed, the roadside services, motor lodges and entertainments began to dry up. Highway 17 is still an important road linking communities but it’s become a four lane. That came at a further expense as when they widened the road they knocked down many of the old facilities. The rest were left derelict. So here I am driving down the highway and trying to remember where things were. Where was Chico’s Monkey Farm and the Dixie Jungle. Once you could see their bright pink advertising signs with garish colors and wacky designs every half mile down the road: “See the Monkeys!”, “Pet the Alligators”, “Pecan Logs” and “Souvenirs”. Men were boiling peanuts by the side of the road and there was scent of barbecue from Mammy’ Kitchen and Howdy’s Restaurant where they had the wild pink flamingos. And there was Archie’s Seafood Restaurant in Darien. Leaving Darien this morning I decided to head north and took Highway 341, which I took all the way up to Griffin, Georgia from where I’m now writing. Got in moments before a thunderstorm hit. Homes: Shotgun cottages, clapboard houses; small brick homes, some fancy, single and double wide trailers. Trees: Pine, willow, maple, magnolias, mimosas, cypress trees in blackwater swamps. Farms, pecan trees, peanut farms, peach groves, the scent of newly cut pine trees on a logging truck. Peach ice cream at Dicky’s Peach Farm. I just enjoyed the ride. I had nowhere to go and there was no hurry to get there. I daydreamed, meditated, prayed and gave thanks. Aren’t all our journeys, whether down memory lane or the four lanes of new adventures, ultimately about love? Remembering it, discovering it, preaching it? Oh, and I passed lots of signs for Vacation Bible Schools. If they don’t teach those kids to love everyone, regardless of what roads they’ve taken to get here, then those classes aren’t worth a wooden nickel. What can one say about Savannah That hasn’t already been said? Probably nothing. Maybe one thing: If you go in the summer you had better be prepared. One day it was 95 degrees (35 Celsius). Today, with the humidity added in, it’s supposed to be 104 (40 Celsius). Fortunately, I was staying downtown at the beautiful 1790 Inn (which was partially built by my great grandfather). It allowed me to park the Harley and walk everywhere. Scouting out locations for scenes for my next novel. For example, if I want the character to die here, then where would the shot come from? Any trees blocking the view? How would the shooter have escaped? Not that way, it’s a one way road. Not that way, too many cameras. You get the idea. I’m looking at trees and bushes, what’s on the ground, tree roots forcing up the brick sidewalk. It’s actually fun. I also figured out where the closing scene will take place (Factor’s Walk), snapped plenty of photos and took loads of notes. I also visited old haunts, walked through the amazing squires with the live oak trees dripping with Spanish moss, and memories. There’s always a melancholy beauty about Savannah. Today, I’m heading another backroads direction, Highway 341 heading north. We’ll see what we encounter as we ride. Safe travels. Back in the Saddle Again; Summer of my 64th year. It’s been a while since I’ve written in this blog. After my college teaching finished this May, I spent a few weeks in London visiting with my boys, who are absolutely the most wonderful young men in the world (and it makes me cry to think of them so far away!). I also made the obligatory stop at the London Harley Dealer, the oldest in Europe, to buy a few tee shirts. I’m staying at the 1790 Inn, which is an amazing place! And more so because my great-grandfather built part of the building in the 1800’s and my relatives lived here into the 1950’s. I highly recommend the place. Also, the place is supposed to be haunted. It was interesting digging out my old travel bag for this trip. I hadn’t used it since last summer. 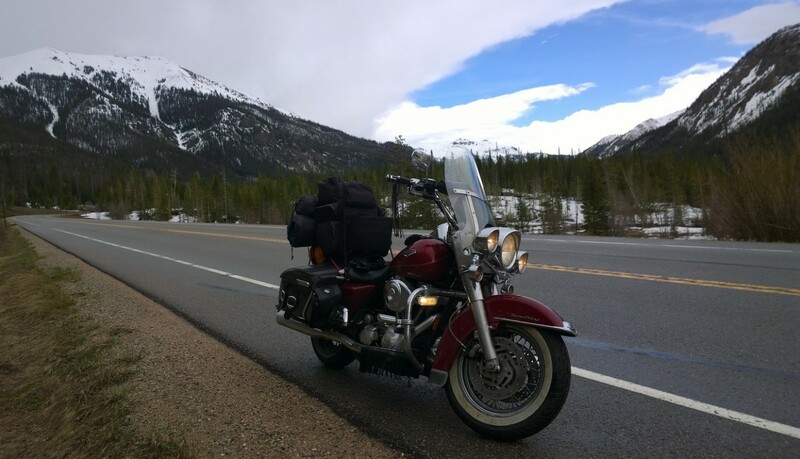 I rummaged through the pockets and found a few receipts: A night at the El Rancho Hotel in Gallup, New Mexico; an oil change at the Harley dealer in Elk, Nevada and a receipt for the Mountain Pine Motel in East Glacier Park, Montana. That was a wild trip to California and up to Montana. I turned the direction of my travels over to God and Fate. When you do that you’re always looking for signs and portents. And you never know where you’ll end up. But when you get there you don’t always get smacked in the face with a mackerel. Sometimes messages from Divine Providence are nonexistent or unclear. Regretfully, on last year’s trip there were no major epiphanies. Bummer. I’m 64 and ½ years old now and feeling it. Sometimes I forget to put the kickstand up when I ride off. Sometimes I struggle with balancing this 800 pound (362kg; 57 stone.) behemoth and somehow during the year, when I wasn’t looking, someone raised my seat level (because I know I haven’t grown shorter! Grown shorter?). Anyway, it’s getting harder to swing my leg over the seat. But I managed today’s trip of over 300 miles safely. So tomorrow I’ll be out taking photos and visiting potential sites for the novel. Tonight I was poignantly overwhelmed with the beauty of Savannah, and my memories of the years I spent here (23) with my family. I hope to also run into cousins I hadn’t seen in a while. One thing I have discovered though is that the perfect beer to pair with hot, humid southern poignancy is a cold draft of Harp lager. Cross Country Motorcycle Novel Continues: Chapters 13 and 14. Monk’s working and maybe romance is building. Sometimes I wondered if it even mattered whether our communion cups were filled with consecrated wine or draft beer, as long as we bent over them long enough to recognize each other as kin. When I came outside of the bar it felt like leaving a movie theatre in the afternoon. I was disoriented. I looked around and saw fast food places and three motels. I couldn’t for the life of me remember where I was staying. I saw a Super 8 motel and started walking toward it. “Hey, Monk!” I heard a voice yell from a car that had Lancelot Diner written on the side of it. I stopped while the person rolled the window down further. That was it. Larry’s. I looked around and spotted it behind me. I went back to the motel, found my room and collapsed on the bed. About an hour later I heard a knock. “Ready to go Monk?” A voice shouted through the door. It was Catherine. “Hold on a minute?” I walked to the bathroom and splashed water on my face but most of it dripped down onto my trousers. I rubbed them with a towel but that didn’t help. I pulled my shirt tail out to try and cover the spots. The babysitter wasn’t much help, or maybe she was. It was clear that she was too distracted by the allures of high school and boyfriends to have done the injuries. Allures like these tend if at all, to result in neglect, not abuse. Also, the picture she painted of the family was of two parents who absolutely loved their child. “So what do you think?” Catherine asked as we were sitting in her car afterwards. “You are a strange monk!” She laughed and shook her head. Then she turned toward me and put her hand on my shoulder. “But hey, thanks. I really appreciate all your help today.” She pushed her hair off her forehead. Was that another preening gesture? I thought I’d seen her make one before. Naw, sure it was just the dreams of an old man. Regardless, I still felt the tug of the old machinery cranking inside, those magical, wonderful, torque full urges that God gave us. She looked at me with a smile that was tired but full of warmth. I let out a sigh as long as Africa. She dropped me off back at Larry’s Hide a While and after we made plans to meet the next morning I walked down to the 7-11 shop and bought a bottle of Corona and went next door for a Chinese takeout. I went back to the room and tuned into a baseball game, the Braves were playing against the Phillies. I ate the chicken and cashew nuts, sipped the cerveza, watched the Braves and fell asleep, dreaming of late-inning rallies. Next morning, after a few text messages to arrange it, Catherine picked me up and we headed for that restaurant named after the knight, Sir Lancelot. Polly was there all smiling and welcoming and I could see Shorty in the kitchen slinging hash. I heard him shout at a waitress: “If you got time to lean, you got time to clean”, followed by “order up”. Polly suddenly appeared with Victor mugs and a carafe. “Here you go.” She said as she poured the coffee into the mugs. I smelt the aroma and watched the steam rise from the cups. The beauty and holiness of the smallest acts which we so take for granted. We ordered up a mess of scrambled eggs, bacon, sausage, and buttermilk biscuits. How to answer that without complicating things any more than I have to, or want to? I took a deep sigh and prayed my tears would stay on some island far off tonight’s coast. “Me too.” I managed a smile that reneged as soon as it flashed. “48, and go ahead and tell me I don’t look it.” She twirled a lock of her shiny black hair. “Me too. Thanks.” I smiled at her and I swear I didn’t know my wink was coming. I shuddered a little and deep inside felt the stirring of the old hydraulics again. Maybe Elvis hadn’t left the building after all.